Caspar David Friedrich was a German Romantic painter. 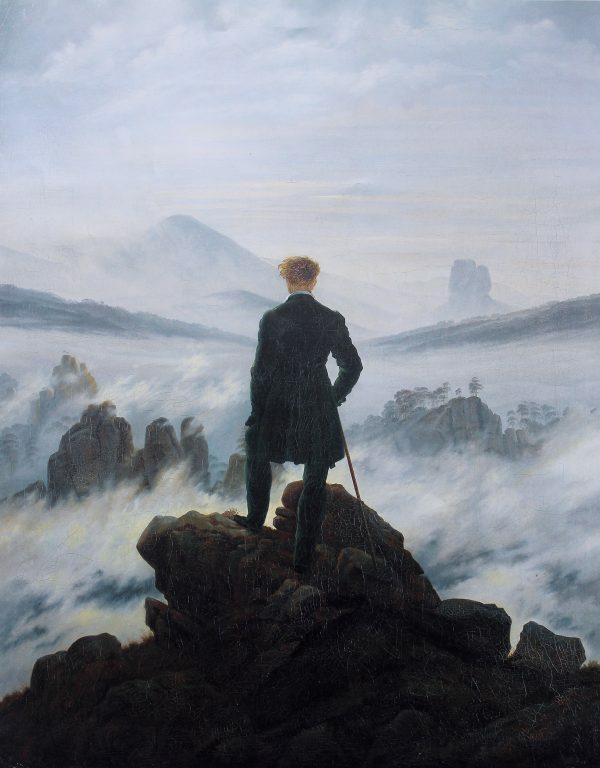 He is most well-known for his painting “Wanderer Above the Sea of Fog.” In this painting, he depicts a gentleman at the top of a mountain looking out into the mysterious and seemingly endless horizon. Mountains can be seen in the distance, coming up from the fog. Why is this painting significant for discussion? It is difficult to discuss this painting without also discussing a general conception of the sublime. In the painting, the mystery exemplified by the fog and the infinite expanse of sky can be said to represent the unknown. Traversing the unknown can make us aware of our own fears and insecurities. It is not always that we enter the unknown with confidence and poise. Thus, the first characteristic of our experience of the sublime is just that: Our inability to absolutely know the unknown or the infinite can make us aware of our own fears and insecurities. The sublime experience, however, is not an experience in which fear and insecurity cripple our ability to accomplish our goals. We see that the gentleman’s pose is quite confident and contemplative as he looks across the unknowable horizon. He seems to have accomplished his goal of making it to the top of the mountain from which he can carefully contemplate the mysteries of his journey so far and his journey to come. Thus, the second characteristic of our experience of the sublime concerns our ability to overcome our fears and insecurities. The gentleman has already found the courage to venture into the unknown. Behind him is the path he’s taken to reach the top of the mountain, and in front of him is the mysterious unknown that he has not yet experienced. He has literally climbed above his previous state by finding the courage within himself to endure and overcome his fears and insecurities. Rising above earthly matters allows him to contemplate the unknowable and the infinite. Rising above earthly matters allows us to contemplate the heavens and the divine, which can have an awe-inspiring and transformational effect on us. Thus, the third characteristic of our experience of the sublime concerns the awe-inspiring and overwhelming transformative effect that comes with courageously confronting our fears and insecurities. 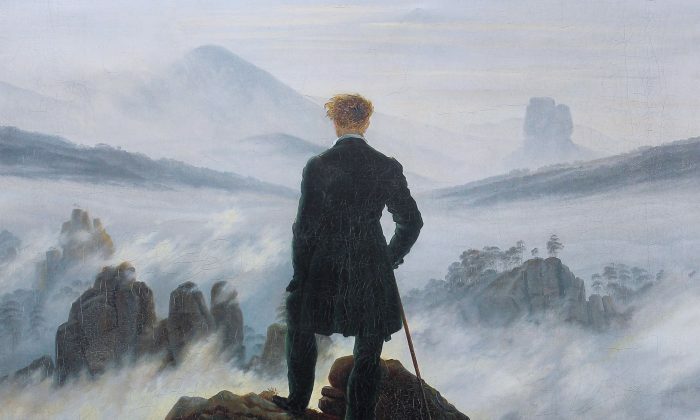 Friedrich’s painting has a message for our modern lives. We are often consumed by earthly matters. The sublime experience allows us put these in perspective. We all have fears and insecurities. We do not, however, have to be forever subjugated to them. Once the earthly matters that consume us inevitably make us aware of our fears and insecurities, somewhere deep inside us we have the ability to confront these fears and insecurities and overcome them. Then what awaits us is our further ascension, contemplating what is seemingly unknowable: the divine. Art has an incredible ability to point to what can’t be seen so that we may ask “What does this mean for me and for everyone who sees it?” “How has it influenced the past and how might it influence the future?” “What does it suggest about the human experience?” These are some of the questions I will explore in my series Reaching Within: What Traditional Art Offers the Heart. Eric Bess is a practicing representational artist. He is currently a doctoral student at the Institute for Doctoral Studies in the Visual Arts (IDSVA).